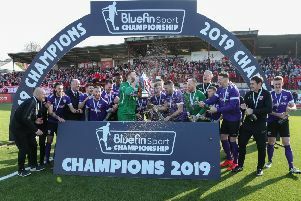 Larne completed a successful season on Saturday when they came from behind to earn a draw against visitors PSNI who, having failed to win the game, are now relegated. The Reds deserved a point from what was a very scrappy end-of-season affair to finish in a very credible fifth place. The home side had the better of the opening 45 minutes, but after the break with the visitors needing the three points they had the best of the exchanges. Larne started brightly with Player of the Year Ciaran Murray going close on six minutes his volley from a Stuart McMullan free flying wide of the upright. James McCabe was then played in by Murray only to see his shot blocked. John Connolly in the home goal pulled off a fine save tipping over a John Dobbin effort from 15 yards. Paul Maguire then was only inches away from giving Larne the lead when his header was just the wrong side of the post. Nine minutes before the break Murray got on the end of a Gerard Gillan quickly taken free but was denied by a fine save from David Harrison. The visitors fighting to avoid relegation were in the ascendancy after the break and almost grabbed the lead on 58 A ball over the top found Joe McWilliams who got in behind the defence but Connolly pushed his shot out for a corner. With 68 minutes gone the visitors took the lead through a cracking long range volley from RyanBerry. With 14 minutes left Paul Maguire showed good close control picking up Murray’s clever ball to curl the ball wide of Harrison for the equaliser. Larne were denied all three points a minute from time. Substitute Darren Stuart played in McCabe but his effort failed trouble Harrison. Team captain Paul Maguire reflected on the season: “We wanted to finish the season with a win but it wasn’t to be. “Overall we are disappointed as we had gone on a great run and I thought we were seriously in contention. “It is a long hard season and credit to anyone who gets promoted as it is very hard.